1535b, CENTER CAP, USED, 87-91, CHEVY, CORSICA, SILVER PAINTED PLASTIC CAP, 5 CUTOUTS MATCH RIM, BLACK OUTLINED RAISED BLACK BOWTIE, 9-1/4" DIA. 2240/2344, CENTER CAP USED, 05-08, DODGE, CHRYSLER, SEBRING, CHARGER, 300, MAGNUM, PLASTIC CAP, NO LOGO, METAL RING, SNAP ON DESIGN, 6-7/8" DIA. 3019, CENTER CAP USED, 91-92, FORD TAURUS, PLASTIC SPARKLE SILVER CAP, ETCHED FORD LOGO, 5 PLASTIC CLIPS, WIRE RING, 7" DIA. 3046, CENTER CAP USED, 93-96, MERCURY, COUGAR, SPARKLE SILVER PLASTIC CAP, 8 RAISES, COUGAR LOGO, 8 PLASTIC CLIPS, WIRE RING, 7-1/4" DIA. 3067/1677a, CENTER CAP USED, 89-92, FORD, THUNDERBIRD, SPARKLE SILVER PLASTIC CAP, ETCHED SILVER LOGO, PUSH IN. 6-7/8" DIA. O/U 1677a CENTER CAP. Price: ORDER UNDER 1677a CENTER CAP. 3067/1677a-e, CENTER CAP USED, 93-97, FORD, THUNDER BIRD, SPARKLE SILVER PLASTIC CAP, ETCHED SILVER BIRD LOGO, PUSH IN. 6-7/8" DIA., ORDER UNDER 1677 CENTER CAP. Price: ORDER UNDER 3448 CENTER CAP. 3285a/3448, CENTER CAP USED, PONY, 17", 98-04, FORD, MUSTANG GT, PLASTIC CAP, BLACK BACKGROUND, CHROME OUTLINED RED, WHITE AND BLUE STRIPES, CHROME HORSE LOGO, 6 PLASTIC CLIPS, WIRE RING, 2-1/2" DIA, ORDER UNDER 3448 CENTER CAP. 3378a, CENTER CAP USED 99-00, MERCURY, COUGAR, SPARKLE SILVER PLASTIC CAP, 6 TRIANGLE INDENTS ON EDGE, COUGAR HEAD LOGO, 6-1/2" DIA. 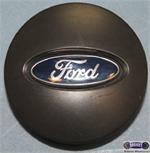 3507b-1, CENTER CAP USED, 02-04, FORD, FOCUS, PLASTIC CAP, BLACK (DARK GRAY), CHROME OUTLINED BLUE OVAL, CHROME FORD, 2-11/16" DIA. 3507b-2, CENTER CAP USED, 02-04, FORD, FOCUS, PLASTIC CAP, SPARKLE SILVER, CHROME OUTLINED BLUE OVAL, CHROME WORD FORD, 2-11/16" DIA. 3517b, CENTER CAP USED, 04-06, Ford, Expedition, SPARKLE SILVER PLASTIC CAP, BLUE FORD OVAL, 6 PLASTIC CLIPS, 6-3/4" DIA. 3539b, CENTER CAP USED, 04-05, MERCURY, SABLE, PLASTIC CAP. SPARKLE SILVER, WITH RAISED LOGO. 5 PLASTIC CLIPS & WIRE RING. 6" DIA. FOR A 16", RIM. 3550, CENTER CAP USED, 04-06, FORD, VAN, E-150, SPARKLE SILVER PLASTIC CAP, 8 INDENTS ON OUTER EDGE, ETCHED LOGO, 5 PLASTIC CLIPS, 7-3/4" DIA.